Is you wedding day coming up soon? 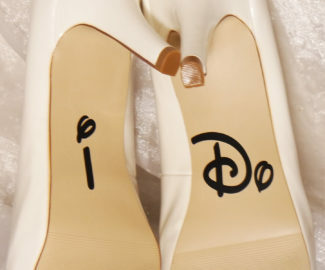 Are shoes the next thing to tackle on the wedding planning checklist? Maybe you’ve already bought a beautiful pair of satin pumps, or perhaps you already have a pair of go to oldies-yet-goodies in the closet. Either way, if you feel like your shoe choice needs spicing up, you’re in luck! 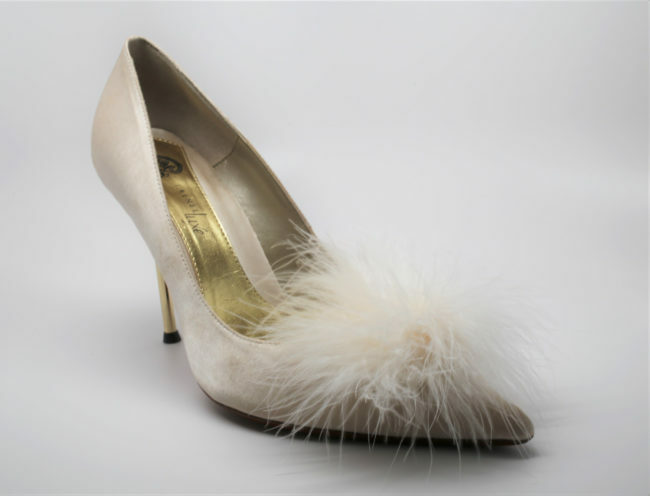 We’ve found 14 ways to dress up a simple pair of shoes that will give your heels a little something special — taking them from basic to absolutely wedding-worthy! 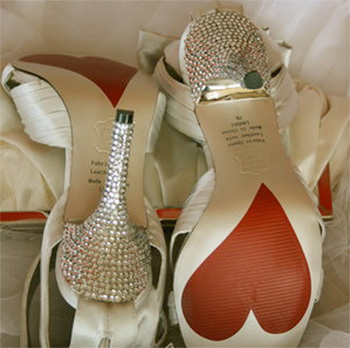 A new pair of shoes should always get broken in long before strutting down the aisle. More importantly, test the soles of the shoes on different types of surfaces beforehand. If your soles aren’t scuffed and there is a chance of a slippery surface, you could find yourself taking a tumble to the ground. Handy for cute photo ops like the one below! 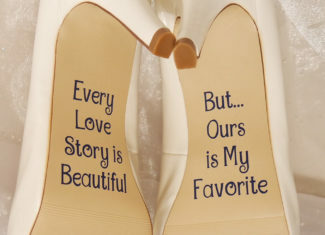 Shoe decals are another great way to have fun during your bride and groom photo session. 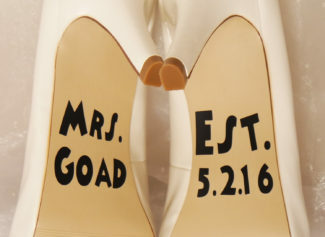 Write something meaningful on the soles such as your names and your wedding date, or I-Do and Me Too. 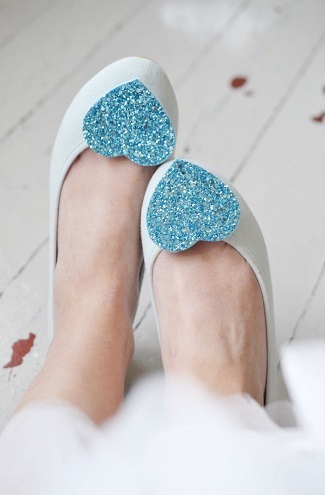 Who doesn’t want a little bling for the top of their shoes?! Attach a pair of fancy shoe clips. Shoe clips are the best way to spice up even the most basic shoes. 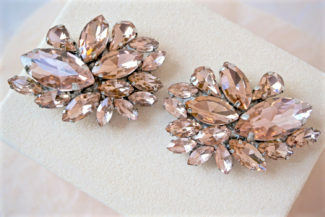 And, after the wedding is said and done the clips can be worn in a variety of ways for other occasions. 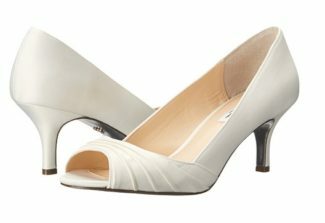 These beauties will add just the right amount of elegance to a beautiful bridal pump — hey, why not include them as your something blue?! 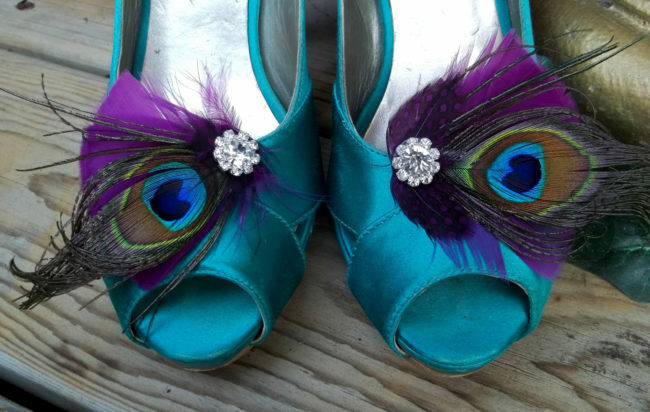 A beautiful peacock themed wedding deserves these wonderful peacock feather clips for your shoes! Check out a recent real wedding we featured to get some more great peacock ideas. 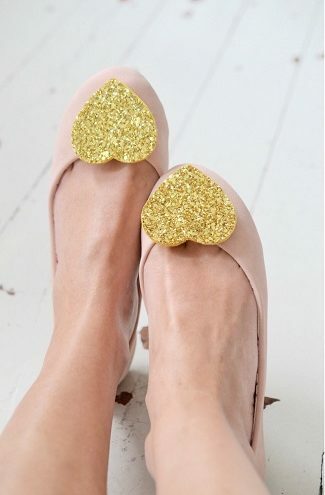 Dazzling big heart shoe clips add a whimsical touch to your wedding day shoes, especially with the lustrous glitter that makes them vibrant and shiny. I like a good bow. In my eyes, nothing says feminine fun more than a well placed bow. Check out Etsy for these beautiful bow shoe clip along with others. 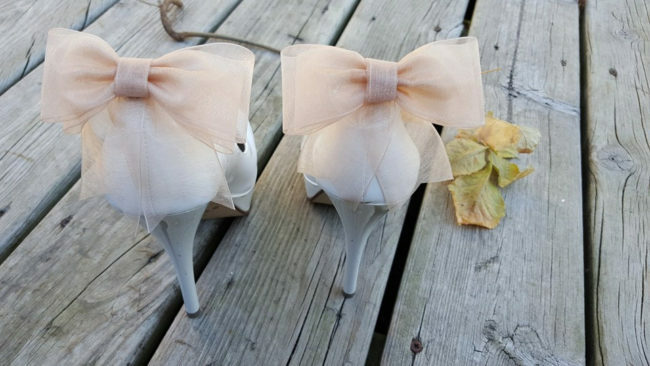 If you are the crafty type, you could always tie some pretty ribbon around a pair of peep-toe pumps. Weddings equal flowers. 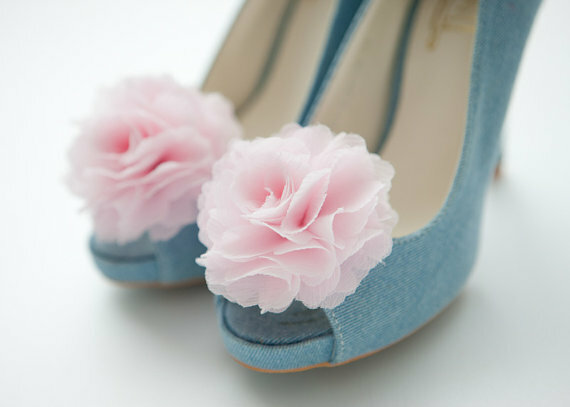 One of the more obvious choices for shoe adornments is adding a flower shoe clip. Simple, cute, and very effective! 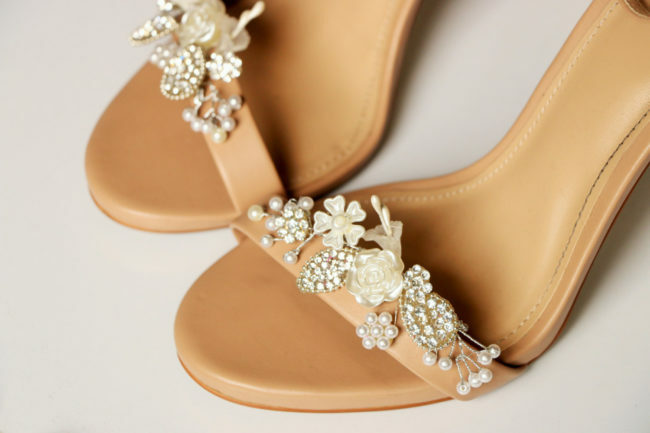 Rhinestones, pearls, and gold leafs make these floral clips rich looking — taking your shoes to a whole new level. 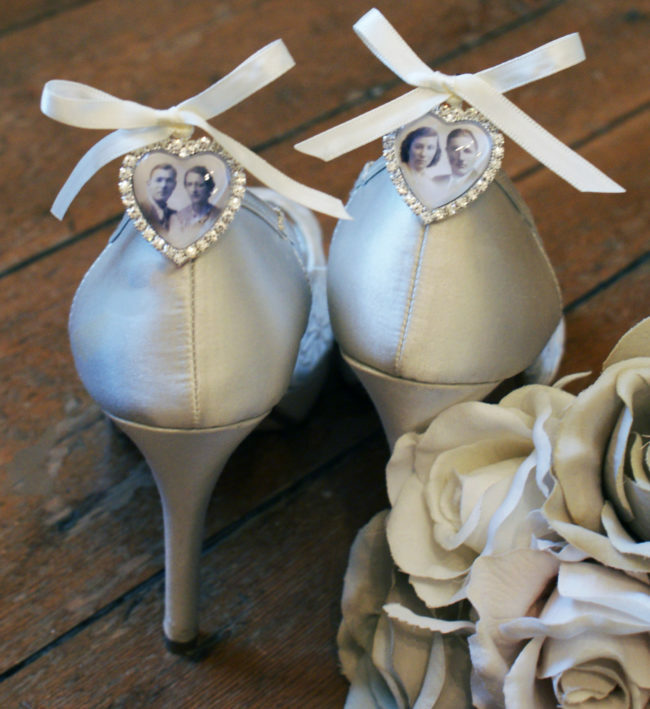 Brides on a budget can give the illusion of paying a fortune for shoes with these floral clips. Soft and delicate pom poms — perfect for a white winter wedding! One thing I like about these uniquely designed shoe clips is that they appear custom made to fit shoes. These vintage inspired pendants are so unique and such a great way to carry the ones you love with you on your special day. Brilliant idea! Are you having a vintage themed wedding? 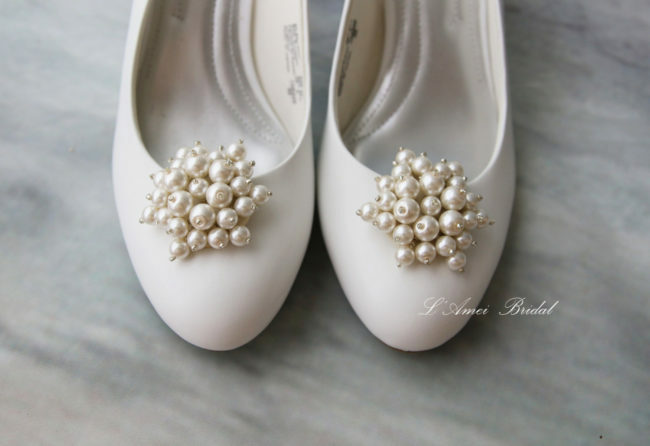 These classic pearls will go beautifully with such a wedding theme. 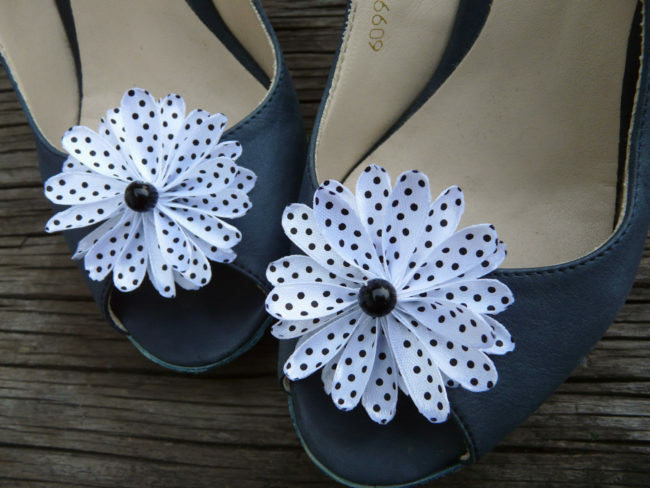 Cute and playful polka dot shoe clips for a whimsical themed wedding. 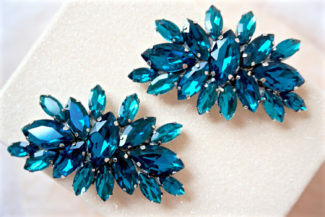 When in doubt – Bedazzle! 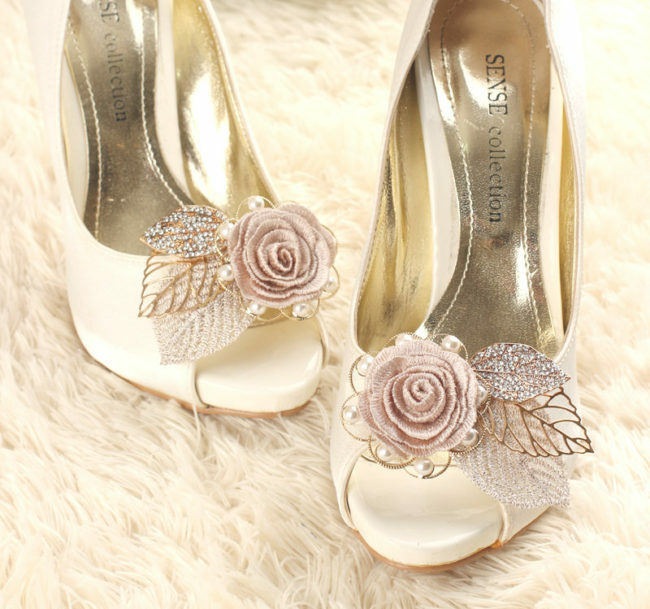 Have fun with your plain white shoes and cover the heels with Adhesive Rhinestone Crystals to add a bit of bling. 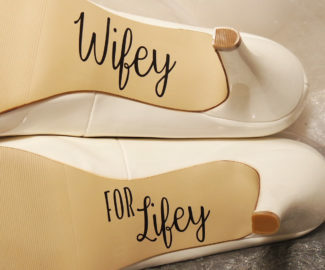 You don’t have to be getting married in the near future to turn a pair of plain shoes into something special. We hope you’re inspired to dress up a simple pair of shoes and make them spectacular!